Whenever I write an article or an account of an event, I try to write from a place within me which is true and honest. I always believe that people are able to spot insincerity from miles away. And through the candlelight vigils held in protest of the detention of the EO6, I had the privilege of hearing the voice of the Rakyat whose message was pure and true. Like all things which are pure and true, they leave a mark in our hearts and a profound impression in our minds for many years to come. "Hidup Rakyat! ", the crowd chanted while I quietly lit my candle. 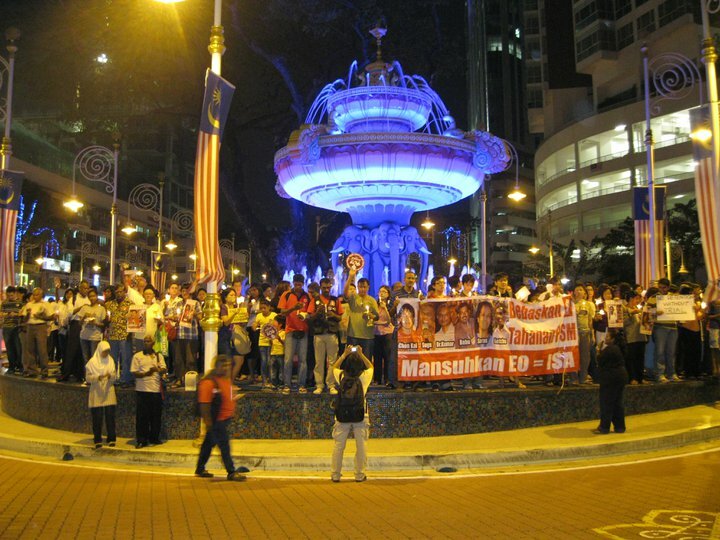 I was standing towards the back of the crowd at Brickfields fountain last Thursday (28 July 2011), completely amazed at the spectrum of people who came in support of the release of the EO6. I saw people of all ages and colours, people from all walks of life turning up for the vigil. I met an old friend of mine, who in turn introduced me to several other people. I was especially impressed to see foreigners, a catholic monk and nuns taking part in the vigil. It struck me that those who were there at the vigil were certainly people who valued their freedom of expression, above and beyond the average Malaysian. Unfortunately for us that night, the Brickfields OCPD ordered those present at the vigil to disperse at about 8:40pm (which was originally scheduled to end at 9pm). The police officers then came marching to Brickfields fountain with their shields and batons. The crowd quickly dispersed within 10 minutes but decided to continue with the vigil in front of the Bukit Aman police headquarters. 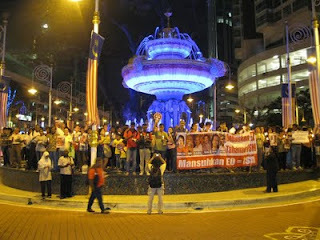 To my surprise, the police officers at Bukit Aman were very calm when they saw us holding our candlelight vigil there. A representative from the Socialist Party Of Malaysia enquired for an update on the status of the detention of the EO6, we were informed that one of the detainees had gone on a hunger strike. At that time, all of us hoped that the EO6 would be released as soon as possible. As we were leaving Bukit Aman that night, little did we know that the EO6 were to be released the following Monday (1 August 2011). Had it not for the Association Of Women Lawyers, I would not have attended the vigil in Brickfields. I would have missed the opportunity to interact with those people who had gone the distance to have their voices heard. I may not always agree with all that was said, but I champion the right for the Rakyat to speak up when the circumstances call for it. And as a lawyer, I would never condone detention without trial. When I was in Myanmar many years ago, I remember staring at the home of Aung San Suu Kyi across the lake, asking myself what it would be like to be under house arrest for so many years. I shuddered at that thought, and I am grateful that the EO6 have since been released. "What makes you attend tonight's vigil? ", I asked one of the Catholic nuns. She smiled and replied peacefully: "We stand for solidarity".